Join us for Bettona’s biggest annual festival. 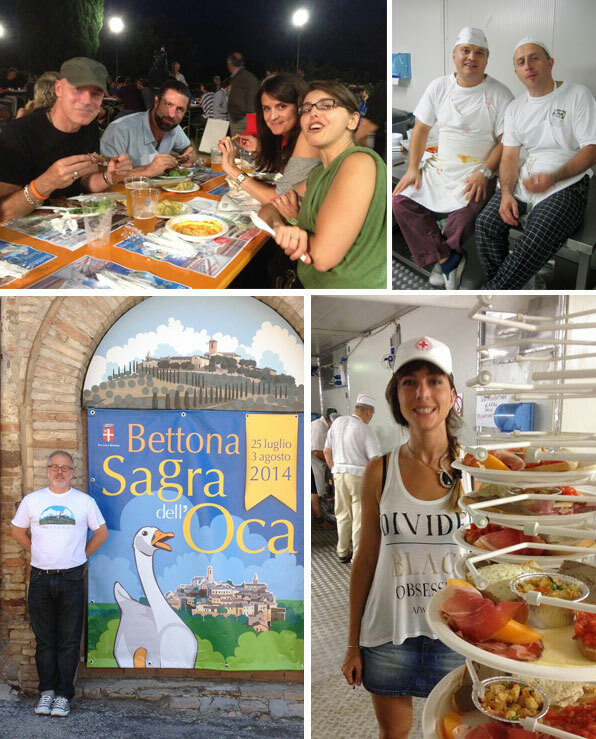 Our annual Sagra dell’Oca (Sagra of the Goose) is a 10 day celebration when the whole town comes alive like no other time of the year. Thousands of people flock to Bettona to enjoy great food — goose being the specialties — for which we are justifiably famous. Our Sagra dell’Oca is an amazing community event when all of us pull together. Organized by our Pro Loco (sort of like a Rotary Club), all of the locals prepare, cook, and serve local cuisine in the typical Italian summer festival style. Our good cooking, which attracts over 1000 people each night, is served in the garden of the former convent of Santa Catarina near the town’s main gate. There will be crowds (and parking is always an adventure) so arrive early (7-ish) and avoid a long wait for our ever popular delicacies. I recommend the roast goose with salad, tagliatelle with goose sauce, and the nightly specials which range from hand made gnocchi to a wonderful “porchetta dell’oca” – goose rolled and roasted like the traditional porchetta. Each night also offers dancing in the main piazza to a variety of Sagra bands. Come one come all, it’s something you’ll never forget. Why not celebrate with a week here? Come, spend a week with us and experience, not only our renown Sagra dell’Oca, but discover the best Umbria has to offer. Week long packages for groups of a few as 4 people include everything from pick up and dropoff at Rome’s Fiumicino airport, meals, daily tours, and accommodations in a wonderfully restored 17-century palazzo in the beautiful walled hill town of Bettona. Your American host is happy to pull out all the stops and make your holiday exactly as you’d like. With a week’s stay you’ll have the opportunity to visit to Assisi, Bevagna, Montefalco, Spello, Spoleto, or Orvieto, to name a few. Customized tour packages available from mid-April till mid-November.